The Major League Soccer season gets under way this weekend and the team at PRO are ready for another exciting year. The offseason has seen a few changes made, including the announcement that TAG Heuer is the new official watch and timekeeper of PRO. The partnership included the unveiling of a new substitution board which will be used for the first time this weekend, and all officials will wear TAG Heuer branding on their jerseys. The Professional Referee Organization has also recently announced that it has renewed its agreement with California-based Match Analysis, to review the performances of officials in 2016. The assignments for the first round of MLS games, which take place on Sunday, were announced last week, and Kevin Stott will be the feature official at the top of North American soccer for both his and the league’s 21st consecutive season. Stott, who made his professional debut in 1996, has been assigned to the game at StubHub Center between LA Galaxy and D.C. United (10:00pm EST). The action begins at the Red Bull Arena where the New York Red Bulls take on Toronto FC (1:30pm EST). Allen Chapman is the man in the middle there, alongside ARs Jeff Muschik and James Conlee, and fourth official Jorge Gonzalez. That is followed by Orlando City versus Real Salt Lake and Chicago Fire versus New York City, both of which kick-off at 2pm, refereed by Chris Penso and Armando Villarreal respectively. The latter will be assisted by Corey Parker – the 2015 MLS AR of the Year – and Peter Manikowski. An hour later Mark Geiger will be the man in the middle for the game between FC Dallas and Philadelphia Union. Geiger was the MLS Referee of the Year in 2011 and officiated in the 2014 FIFA World Cup, taking charge of three matches including the second round tie between France and Nigeria. Craig Lowry will assist Geiger at Toyota Stadium, to start his 21st consecutive season, while, at the same time, fellow long-serving AR Kermit Quisenberry will be running the line at BBVA Compass Stadium, where Houston Dynamo lock horns with New England Revolution. Quisenberry has also been an official in MLS since 1996, and will be assisting center official Jose Carlos Rivero this weekend. At 4:30pm (EST), in a rematch of last year’s MLS Cup Final, Portland Timbers play Columbus Crew at Providence Park. Baldomero Toledo will referee this one. He has taken charge of two MLS Cup Finals in the last eight years (2008 and 2010). 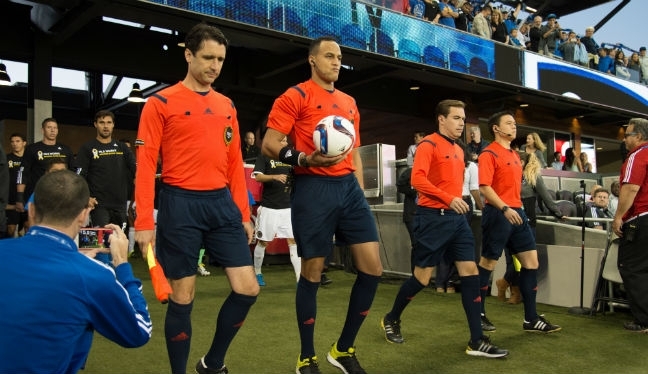 Ismail Elfath, who was assigned 22 MLS regular season games in 2015, starts the new year at BC Place for Vancouver Whitecaps versus Montreal Impact, alongside ARs Jeff Hosking and Eduardo Mariscal, and fourth official Baboucarr Jallow. The 2015 MLS Referee of the Year, Alan Kelly, has been assigned to the game between Seattle Sounders and Sporting Kansas City at CenturyLink Field (7:00pm EST), while newly-appointed FIFA referee, Ted Unkel, will be in the middle at Avaya Stadium for San Jose Earthquakes versus Colorado Rapids.